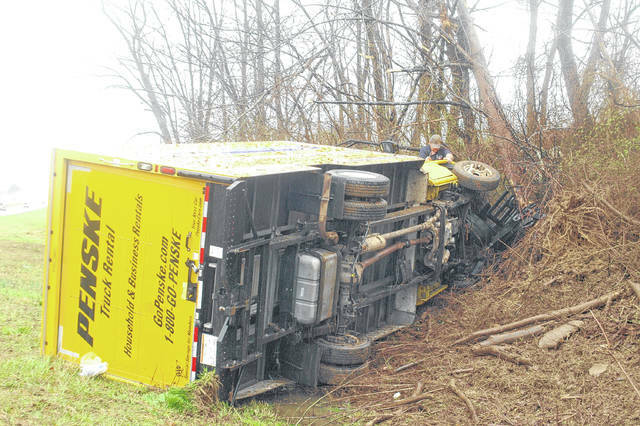 The truck reportedly rolled a single time onto its side after striking the ditch and adjacent trees. Gallia EMS personnel with members of the Rio Grande and Centerville fire departments respond to the scene of a large truck on its side on Wednesday. Here, personnel administer first aid to the occupants of the truck. RIO GRANDE — Wednesday afternoon just after 4 p.m., Gallia County 911 dropped tones for the Centerville and Rio Grande fire departments to respond to a reported yellow Penske truck on its side with smoke showing and two occupants entrapped in the area of U.S. 35 near the intersection of Ohio 279. According to Sgt. Hurd with the Ohio State Highway Patrol, the vehicle reportedly traveled off the right side of the road while moving eastbound just past the Ohio 279 intersection, continuing until it struck a large ditch and several trees at road speed. Good samaritans in the vicinity stopped to help, one of which reportedly used a safety hammer to bust the windshield and get the driver and passenger from the vehicle. Hurd reported that both patients left the scene with Gallia County EMS and were transported to Holzer Medical Center with non-life threatening injuries. According to one witness on scene, both the driver and passenger were conscious and talking before law enforcement and EMS arrived on scene. The incident is still under investigation with no citations issued at press time.